This procedure is usually performed under local anesthesia. Your dentist at Berger Premier Dentistry will create an incision through the gum tissue in order to expose the jawbone. A hole, where the screw-shaped titanium post will be implanted, will be carefully drilled before replacing and stitching the gums back to its position. The implant will be left to heal for about eight weeks, allowing it to fuse to the surrounding bone. Once the healing phase is complete, the final procedure of attaching the dental crown to the implanted post will be performed. 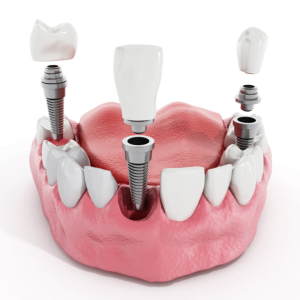 Implants are meant to replace the root part of the missing teeth. The crown that will cover the implant is customized to fit the shape and color of the patient’s natural teeth for more natural-looking results. Dental implant procedure may take about three to six months to complete and the recovery period could last anywhere from two to three months. Most patients at our dental office experience some soreness that lasts for a few days following the procedure. Patients are free to go back to their regular routines right after their procedure with some caution. With proper dental care and maintenance, dental implants can last for up to 25 years.